Well, hello friends! Can you believe it? Waffle Flower Crafts is already 1 year old! And what a great first year it has been! I'm super happy that I got to be part of this exciting adventure from the beginning, and wish Nina lots of success for the coming years. 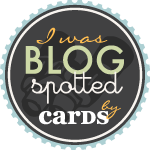 Ok, so the DT is blog hopping today to celebrate. You should have arrived from the blog of the ever fabulous Katie Gehring or, if you got lost, you can find the start of the hop here. I finally chose Loved stamp set, which is one of the prettiest floral sets I've ever seen. Being one of the first sets released by Waffle Flower, I guess we can say that now it's a classic. It's super versatile and allows millions of different color combinations. I combined it with another great set that I predict will also become a classic in the sentiment category because of it's gorgeous font: In Every Way stamp set. As you can see, some simple stamping and a bit of die cutting with it's coordinating dies goes a long way with all this different lovely flowers and vines. If you don't already follow Waffle Flower Crafts in social media, I highly encourage you to do it so you don't miss any of the exciting stuff that we have in store for you this second year! Your next stop on the hop is my talented teamie Sabrina Alery. Thanks for hopping with us on this special celebration! That is a really lovely set, so many different ways to stamp it. Your card is beautiful! Beautiful card! I like these stamps! Lorena, that IS a "tough" question. Quite honestly, I haven't seen anything here, yet, that I didn't like. I remember seeing this very set you've used today and I really liked it then and I still do. Your card is "amazing", and no pun intended! Beautiful set and cards, thanks for the chance! This Loved set is one of my very favorites!! I adore sets that let you build flower arrangements!! I also absolutely love WF Flower Circles set. Your card is just gorgeous!!! Love the way you did the flowers behind the sentiment strip. My favorite one is Stay Focused! This card is so beautiful and perfect for celebrate spring and this amazing hop! Such a beautiful card! Love! This is a different floral set. It is very versatile. Beautiful card. My favorite WF product so far is the Planted stamp set and its matching Pots die set. I love the sentiment across the front, it looks good. Very pretty card. Lovely! I love the flowers peeking from behind the sentiment - perf!! Happy 1st anniv.! Oh wow that background with the flowers is so pretty! Amazing card!! Love how you used all the colorful flower as a frame. My favorite set is the DT designs! Everyone needs a LOvE stamp. Beautiful, that card is 😊. Happy Birthday, Waffle Flower! The Loved set is the only one I own and I really do love it alot!! My favourite product from the new release is the Doily Square Dies, I can already imagine what cards I would make with them!! And love your card by the way, your flowers look beautiful and love how you used the sentiment stamps too! Fantastic cards made with fantastic stamps. My fave!